On April 5, the Selectboard will discuss expanding the charge of the Energy Committee to include Climate Change Action. See details of the changes here. The Wellfleet Community Forum and the Energy Committee held a public forum on May 21, 2018, at the Senior Center as an initial public introduction to the project. Wellfleet is planning a solar photovoltaic (PV) array on the capped landfill. After issuing a Request for Proposals (RFP) and receiving three proposals, the town has decided to enter into negotiations and selected Ameresco for an energy services contract to design, obtain permits, construct, operate, maintain and decommission a 1.2 Megawatt array of 2500 panels on top of the landfill. The panels will be less than 6 feet off the ground (at the highest point under the rack of panels) and will meet the 100-foot setback requirements. Wellfleet has completed a second Solarize grant as part of the Outer Cape Energize Program. Outer Cape Energize is a joint program of the Towns and Energy Committees of Provincetown, Truro, Wellfleet, and Eastham. Check the Outer Cape Energize website for more details. Beware of aggressive marketing and “slamming,” in which customers have electricity providers switched without their permission or fooled by short term rates that expire with costs to switch back to a reasonable rate. The Wellfleet Energy Committee just competed two major project, becoming a Green Community and the Solarize Wellfleet Program and is working on a a Solar Array at the capped landfill. 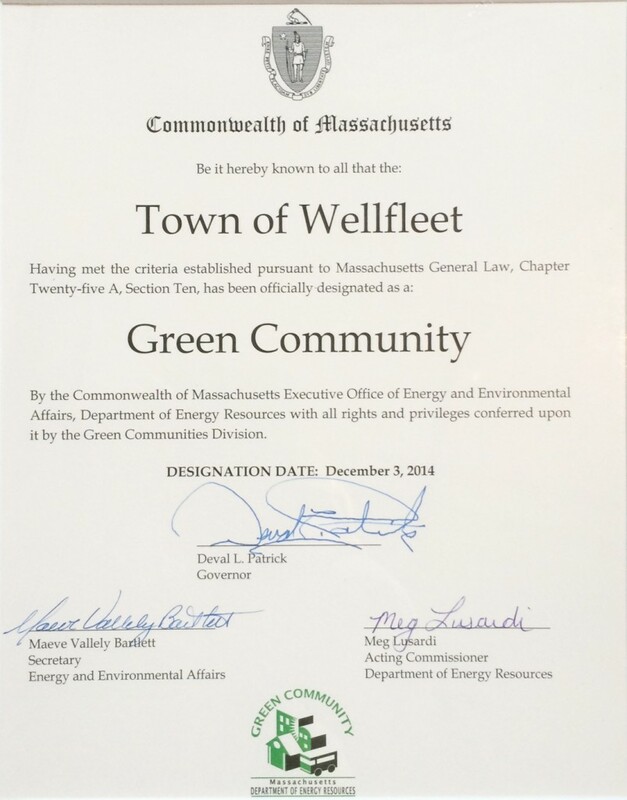 1) Wellflleet has been designated as a Green Community. There were five criteria. We passed Criteria 1 and 2, the Zoning article and Expedited Permitting article in 2013 at the annual town meeting. An article to adopt the “Stretch Code” (Criteria 5) passed the 2014 Annual Town Meeting. The Board of Selectmen approved a plan for the use of high mileage vehicles where feasible earlier in 2014 (Criteria 4) . The last step involved an energy reduction plan that was developed with the assistance of the Cape Light Compact by Larry Franke with help from Marcus Springer. Here is a draft of the plan that was reviewed with the Selectmen on 9/16/2014. 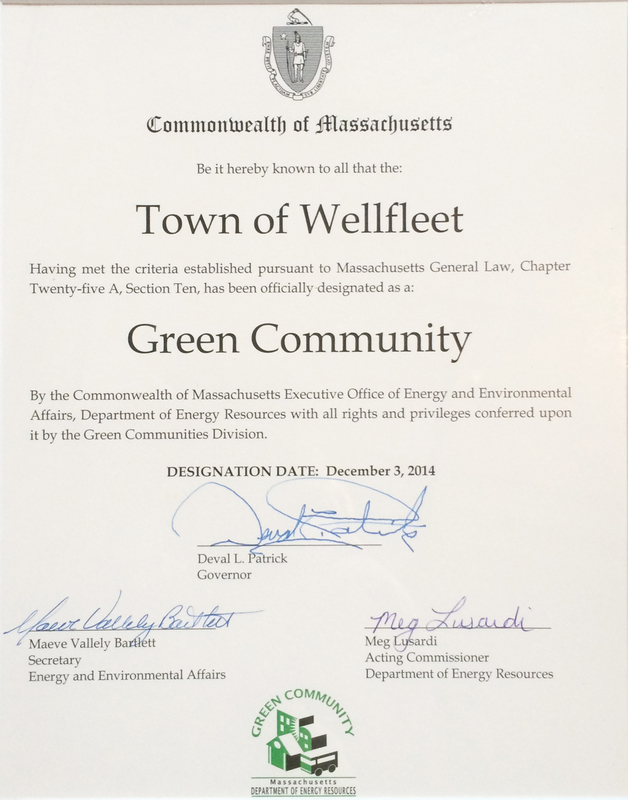 The final version of the Wellfleet- Energy Reduction Plan was submitted for the BOS adoption 9/30/14. 2) We are in the early planning stages of installing a photovoltaic array on the Wellfleet capped landfill next to the Transfer Station. 3) We sponsored Solarize Wellfleet. This was an initiative to educate homeowners and businesses in Wellfleet about installing solar arrays and organizing a group buy to lower costs. The program ended on June 30, having exceeded its goal of reaching more than 200 kW of installed capacity. The program is now over and 133 households have agreed to install 655 kW of capacity, over three times our goal for the program. Wellfleet homeowners contracted to add solar installations to about 3% of the houses in Wellfleet as part of this program, making us one of the most “solarized” towns in the state. On January 28, the Board of Selectmen reviewed a revised Aggregation Plan from the Cape Light Compact. This is the first revision in thirteen years. There was a public hearing in Mashpee on May 14 on the aggregation plan, which was submitted to the DPU and the underwent a technical review which added clarifying material.